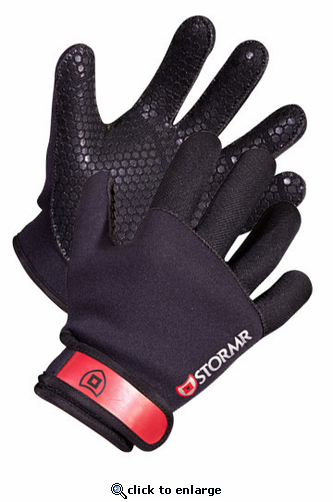 The STRYKR Glove keeps extremities warm in driving rain and wind with Premium Micro-Fleece Lined Neoprene. Its also ideal for working and gripping with durable material on palm and fingers align with 2mm total thickness. Comfort and quality is assured through the adjustable wrist closure and the glued and external blind-stitched seams. Our Stormr products use Neoprene Core Technology and Fusion VAPR Technology to adapt the benefits generations of divers and surfers have used to defy the elements to land-based and amphibious activities. If you hunt, fish in freshwater or salt, or participate in any outdoor activity that requires superior mobility in harsh environments, no other gear will allow you to remain as flexible in tough conditions as STORMR's outerwear. Each element of this complete lineup of foul-weather gear provides maximum comfort and maneuverability, as well as huge thermal benefits in a thin, soft, flexible, windproof and waterproof shell. There�s nothing else like them on the market today.